The Gem Mine - a work in progress! This is a piece I've had on my backburner for the past few months, which is about to get bumped up a couple levels. It is my tribute to Dr. Seuss - specifically as an homage to his piece Minor Cat Miner In A High Yield Emerald Mine (which can be found in the book, The Secret Art of Dr. Seuss. So far I haven't found a good image of it online.) This preview is a quick shot from a webcam - I'm excited for when this piece will be ready for more proper presentation. I have some plans in store for this. Today I sat down by Lake Merritt, listened to the birds and npr, and said to myself, "No more dawdling on this ninth piece. Let's get it done." So I got it done. So now that I finished it, I can show the third triptych of my Coming Into Focus series. This December, my art will be inhabiting three group exhibitions in the East Bay. Come visit! Pieces from my No Man An Island Series are available at Blankspace Gallery during its Holidayland show from November 27 till December 20. 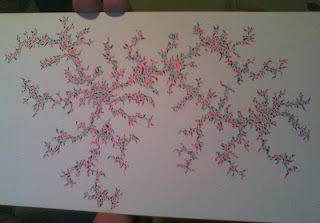 Each of these No Mans are around a square inch in size, encased in a 3.75" x 3.25" frame. First Friday Reception for this show is this Friday, December 4 from 6-10pm. Congregate is going to be in Slate Art and Design's The Color Show, which will be holding its opening reception this Friday, December 4th from 6-9pm. The show will continue on until the 19th. Decoder Ring will be at Expressions Gallery for its show, Past Present and Future. The opening reception for this show is Saturday, December 12th from 6-8pm, and the show will be up until February 5th.